Set nine years after GoldenEye‘s attention-grabbing intro in Russia, we catch up with 007 seemingly enjoying some leisure time while racing his vintage Aston Martin DB5 around Monaco’s winding mountain roads alongside a prim and nervous MI6 evaluator (whose name is Caroline, not that it matters.) While Bond is already a relatively unsafe driver while escorting the poor woman, he escalates their “pleasant drive in the country” when he catches the eye of a dangerous brunette in a sharp red Ferrari in what becomes a more light-hearted version of Bond meeting Tracy in On Her Majesty’s Secret Service. Of course, Caroline can’t stand Bond’s flirtatious hijinks while racing Xenia and demands that he stop the car “at once!” He does so…somehow turning her on and accelerating their romance by revealing a bottle of Bollinger champagne chilling in a built-in cooler installed in the DB5’s center console. So not only would Bond risk both his life and hers to impress a woman he’s never seen before, but he’s not above drinking while under the influence of either alcohol or product placement. Jeannie: See, to me, this is a waste… the shirt you got on under your sweater. It sits for three weeks in your drawer, waiting to come out, and when it finally does, it sticks up only half an inch out of your collar. Jerry: (charmed) I’m Jerry Seinfeld. 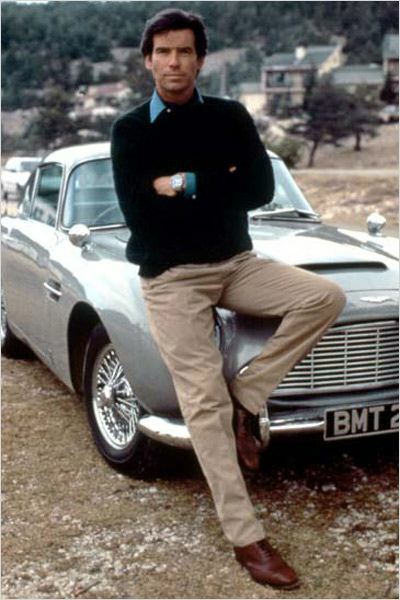 Bond looks especially debonair for his DB5 ride with a nicely-layered blue shirt and sweater and a printed silk day cravat to add an affectation of elegance, reinforcing that the ruggedly serious 007 of the short-lived Dalton era has been replaced by well-dressed gentleman with an emphasis on style. Matt Spaiser also provided an analysis of this outfit on his blog, The Suits of James Bond. Bond’s French blue cotton shirt is the same one that he wears the next day with his blazer when sneaking aboard Xenia’s yacht. It has white buttons on the rounded cuffs and down the front placket, which is mostly concealed by the sweater. The repeating small-scale block pattern on Bond’s dark green day cravat is referred to as “foulard”, although foulard also initially only referred to the lightweight silk cloth. Bond’s outer layer is a dark navy cable knit wool sweater. The shirt collar is worn outside the jumper’s crew neck top, and his ribbed cuffs are rolled back to reveal his shirt cuffs and – on his left wrist – his new Omega Seamaster watch… but more on that later. No movie featuring a car going fast is complete without a shot of the protagonist showing off his or her knowledge of a manual transmission. The next morning, for his investigation aboard the yacht, he ditches the jumper and day cravat for an elegant dark navy double-breasted blazer and different slacks, while still wearing the same shirt and shoes. Bond’s trousers go mostly unseen through the sequence, only briefly glimpsed during the obligatory gear-switching shot and the less-obligatory Bollinger-revealing shot. Still, publicity shots clearly show Pierce Brosnan wearing a pair of tan cotton trousers with at least one or two double reverse pleats and tapered, plain-hemmed bottoms. At first, I considered that he might be wearing the same sand-colored Brioni khakis that he wears with his blazer on the yacht, but those trousers were excessively (in my opinion) triple-pleated with cuffs. 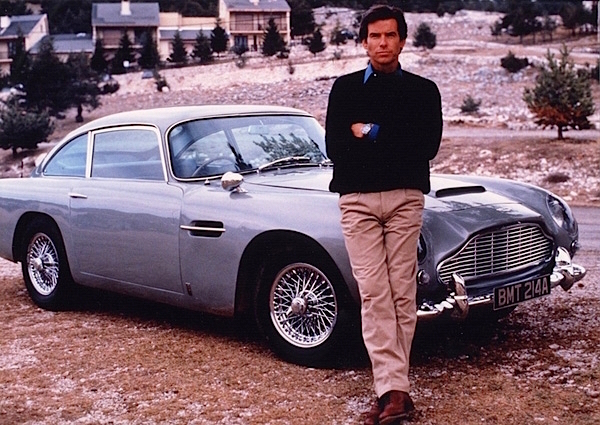 A publicity shot of Pierce Brosnan with the GoldenEye DB5. Based on his footwear and the context of the scene, Bond is likely wearing the same brown leather belt with a gold single-claw buckle. This belt would match the “walnut brown” Nevada leather Church’s Chetwynd full-brogue oxfords that Bond has been definitively identified as wearing both in this scene and the following day with his blazer. These 5-eyelet medallion-toe oxfords, also featured on James Bond Lifestyle, are perforated along each seam. In one of the publicity photos, a hint of darker brown can be seen in a gap between the trouser bottom and the shoe, suggesting that Bond is sporting brown socks. Brosnan’s film-worn shoes were auctioned by Christie’s in their “Film and Entertainment Memorabilia” auction on December 19, 2007 in London, fetching £1,080 (approximately $2,174). Omega must have been pleased to see their product placement deal paying off in this early scene as Bond wears the sleeves of his sweater rolled up enough to show off his fancy new stainless wristwatch while racing against Xenia’s Ferrari. The featured watch is an Omega Seamaster Professional 2541.80.00 with a blue bezel, blue dial, date window, and stainless steel bracelet. “Don’t worry, I’m also rich,” Bond assures Xenia. This would be the only appearance of a watch with Omega’s 1538 quartz movement; beginning with Tomorrow Never Dies, Bond sports automatic movement Omegas. Brosnan establishes himself as one of the more cheeky Bonds as he unabashedly juggles the attentions of two very different women against each other… which is certainly not a way to treat people but does make for an entertaining car chase as classic elegance meets modern performance. …his car brings the date to him. 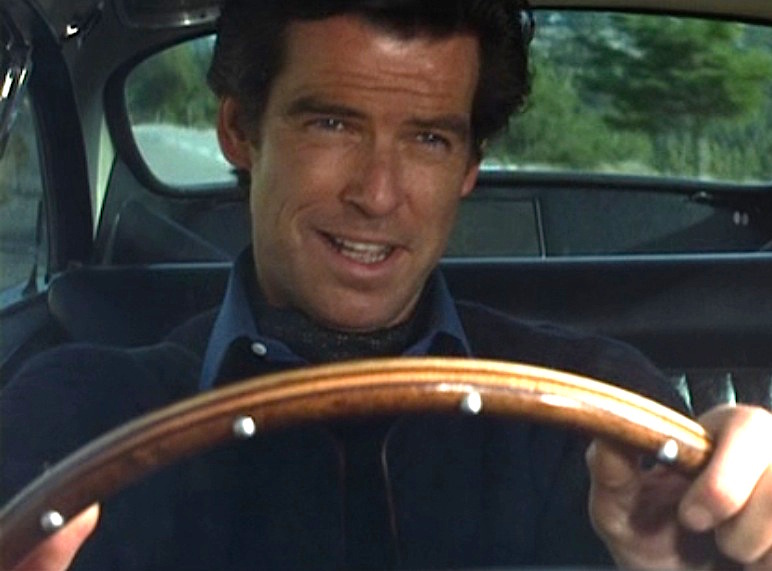 Some may call it classy while others deride it as sleazy… but it’s worth noting that Bond’s DB5 has been tricked out in GoldenEye not with an ejector seat, twin machine guns, or an oil slick… but with a cooler built in to the center console where he can safely store a bottle of Bollinger La Grande Année 1988. If that doesn’t solidify Brosnan as one of the most romantic of the Bonds, I don’t know what would. 007 slips behind the wheel in style, understanding that you never know who you’ll meet when out on the road, especially in an exotic and wealthy locale like Momaco. Iconic Alternatives has a great rundown of affordable options to channel elements of this, such as the sweater and oxford brogues, and many other 007 outfits. To read Matt Spaiser’s analysis of this outfit on The Suits of James Bond, check out his post here.